Oobleck is the non-Newtonian fluid that makes people of all ages act like kids. Part solid, part liquid it can create hours of fascinating fun. 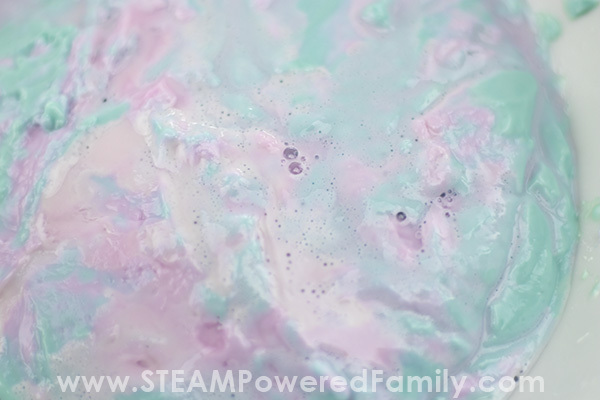 In this oobleck science experiment we brought together our recent studies with pH indicator with our beloved oobleck to create a magical, colour changing oobleck science experiment like no other. 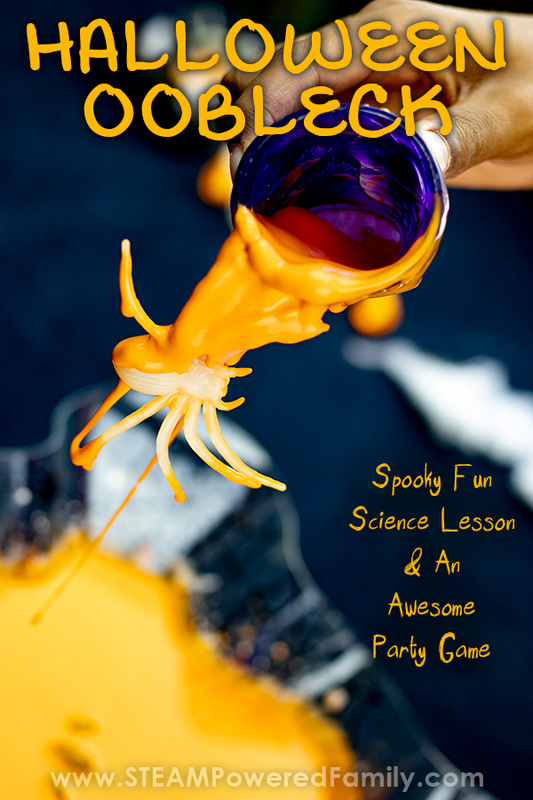 Have you ever played with oobleck? The stuff is crazy cool and so much fun to explore. If you punch it it is solid. If you squish it, it’s solid. Apply pressure in any way, and it is solid. Let go of the oobleck and it will flow through your fingers. Rest your hand without pressure and your hand will sink. It is fascinating to play with, and in this science experiment we have upped the cool factor by using chemistry to change the colour of our oobleck like magic. But what exactly is oobleck, sometimes also called goop or magic mudd? It’s officially a non-Newtonian fluid according to scientists. Why? Well let’s jump into a little science. Issac Newton had a number of theories around fluid dynamics. With oobleck we have a non-Newtonian fluid because it doesn’t follow Newton’s Law of Viscosity. Newton’s Law of Viscosity states: the shear stress between adjacent fluid layers is proportional to the negative value of the velocity gradient between the two layers. Well, I’m sure that makes everything as clear as our magic mud. So let’s dig into this science a bit and see if we can make some sense of it. The behaviour of a fluid while flowing is affected by two key properties of the fluid: density and viscosity. Density is the mass of an object divided by it’s volume. It is the reason ice floats in your drink, ice is less dense than your drink. Or why oil floats on water. Again oil is less dense than water. Lighter fluids will float on heavier fluids. We tested this in our Lollipop Layers experiment. Viscosity is a fluid’s resistance level when flowing. Think of how water flows compared to molasses. Molasses has much higher viscosity. A simple experiment to demonstrate viscosity is to compare how clean water flows compared to water filled with dirt (aka mud). Mud has much higher viscosity than clean water. So when we are looking at Newton’s Law of Viscosity we are discussing how fluids react due to the friction created between the molecules when flowing. If there is a lot of friction, it is a thicker liquid, and has a higher viscosity. So Newtonian fluids follow this law of viscosity and flow predictably. Then there is our beloved Oobleck that breaks all the rules and is known as a non-Newtonian fluid. 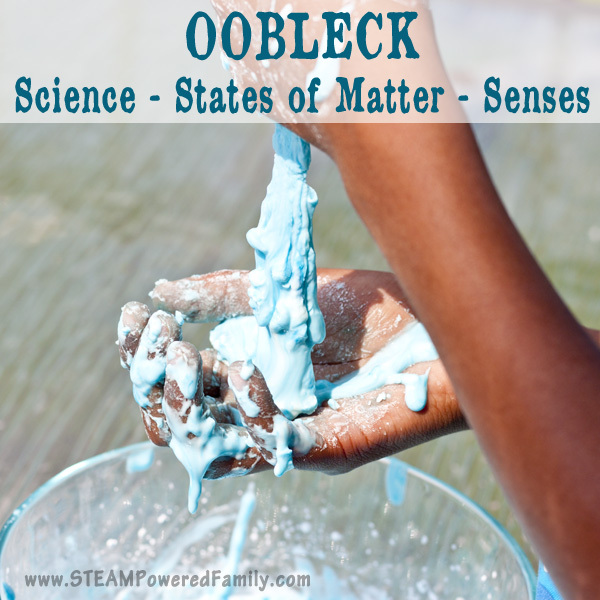 The rule breaker – Is Oobleck A Solid or a Liquid? If you have ever played with oobleck you know it doesn’t behave the way you would expect at all. When you apply force to oobleck it becomes a solid. You can actually walk on it, or mold it like play dough, as long as you keep the force up. As soon as you release the force and pressure, it turns into a flowing liquid. If you are walking on it and stop, you will sink. If you are squishing it like play dough and relax your hand, it will flow through your fingers. Pro Tip! A Hexbug Nano does not exert enough pressure to walk/wiggle on top of oobleck. RIP little green Hexbug. You gave yourself in the name of science and we appreciate your sacrifice in our pursuit of knowledge. It changes from solid to liquid in your hands, making it a great sensory experience. It is also a great way to keep the kids busy on a sunny day. A bucket of this will keep them playing for hours. Just be prepared, this stuff is messy! During our recent studies creating our own pH indicator and testing items from the kitchen, we unintentionally created oobleck in one of our test tubes. It resulted in a boring result from a pH perspective, but it gave us inspiration for some additional areas of study. In another science experiment with baking soda and baking powder, we learned that corn starch is used as a stabilizing agent in baking powder. Oobleck is made with corn starch. The roots of an epic oobleck science experiment were seeded! After planning our experiment, including our variables, hypothesis and process, we were ready for some messy oobleck science! Pro Tip! Oobleck is MESSY! Plus we are working with acids and bases. Prepare the area and your scientists appropriately. This involves draping, safety glasses, gloves, etc. as needed. Use caution and common sense whenever you are doing science! Want to do a deep dive Oobleck Science Fair project to explore how changing the ingredients affects your oobleck? Check out what we did here! Safety and protective pieces – table coverings, towels, gloves, protective glasses, etc. The first step in our science experiment was to make pH indicator from red cabbage. 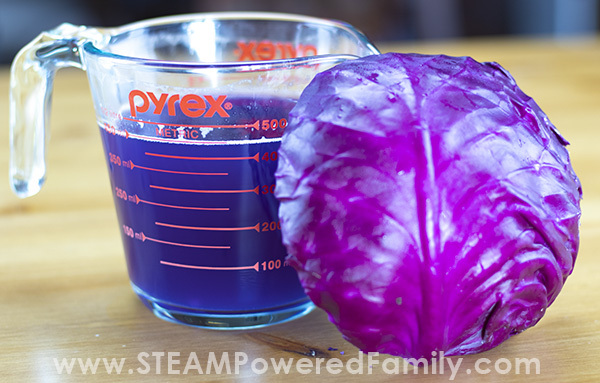 You can read more on the process of making pH Indicator in our earlier experiment, but in a nutshell chop up your cabbage, add hot water, blend it up in the blender, strain liquid into a container, and voila! You have your pH indicator. Notice we did not follow the traditional 2 : 1 ratio for making oobleck! Normally we make oobleck with 2 parts corn starch to 1 part water. For our science fair style investigation, we needed to do things a little differently. We mixed the two ingredients together slowly until we created a play dough consistency. If needed, we added a bit more pH liquid or corn starch until we had the right play dough feel. Since we will be adding more liquids during our experiments, we don’t want it to become oobleck quite yet. We want it to start out fairly solid. Later on in the experiment it will start to do the fascinating non-Newtonian fluid dynamics. 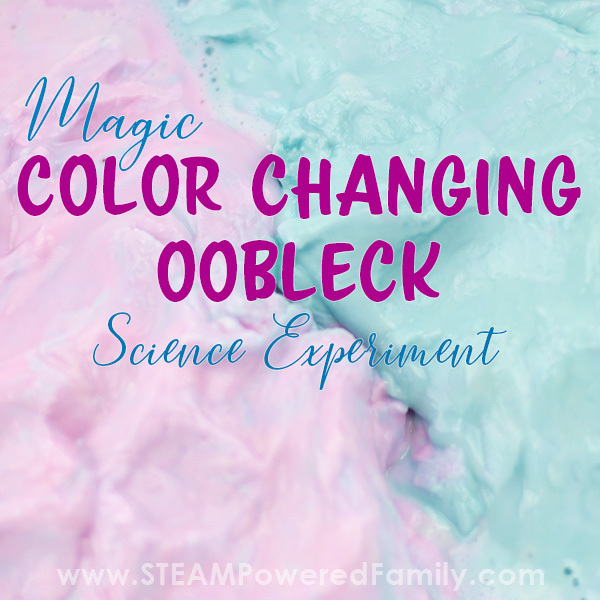 It is best to do your color changing oobleck science experiment in a clear bowl so you can see the reactions. You have two options, in the video we made one big pie of dough and worked on opposite sides. This allowed us to keep the middle as a constant variable so we would always have the centre section to remind us of the original colour. It did get a bit messy later on when we had to remove the middle section, but it was doable. If you don’t feel you need this, you can divide your play dough oobleck into two sections and set on opposite sides of the dish. Just take note the pale purple colour of the oobleck at this stage. I added a bit of acid and base to our play dough to test colour change. It looks a bit green in the image but it is actually blue, and you can see some of the pink. With the rest still the original purple. We had proof of concept! Time to do our oobleck experiment. Fill one glass with white vinegar. In another create a baking soda solution by mixing 2 portions of water to 1 portion of baking soda. Stir (it will settle and require stirring regularly). To get the best results add your acid (vinegar) and base (baking soda), using a syringe or pipette. It is best to have two, so you don’t accidentally mix your acid and base. You want your reactions to happen at the right time! To start the colour changing add some vinegar to one portion of the oobleck. Mix it together with your hands to see how it turns pink, indicting an acid (vinegar may sting, so best to use gloves and protective glasses in case of splashing). We added it in 2 mL increments. Continue adding until your oobleck is nice and pink and behaving as a non-Newtonian fluid. To the other portion add the baking soda mixture. Mix it together to see how it turns blue, indicating a base. Continue adding baking soda solution 2 mL at a time and mixing well until it behaves as a non-Newtonian fluid. 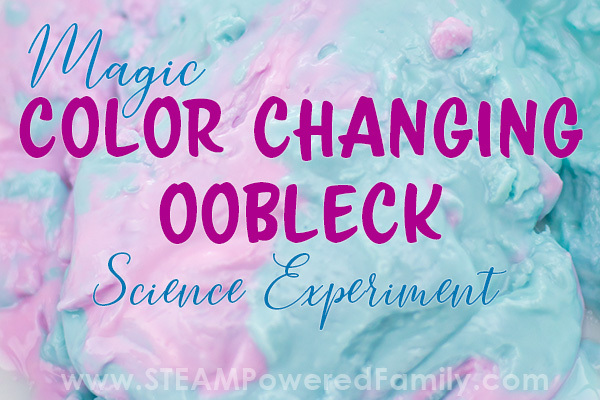 Watch how the oobleck changes colour and how the colour travels through the oobleck. Do they mix or stay separated? Play with the oobleck and see how the colours move and travel through the mixture as it becomes solid then fluid. Mix it up really good. What do you notice happening? It should start turning more and more blue. Once it is quite blue, add some more vinegar. Notice how it turns pink where you add the vinegar. Look closely… what else is happening? Bubbles are forming and a chemical reaction is taking place. 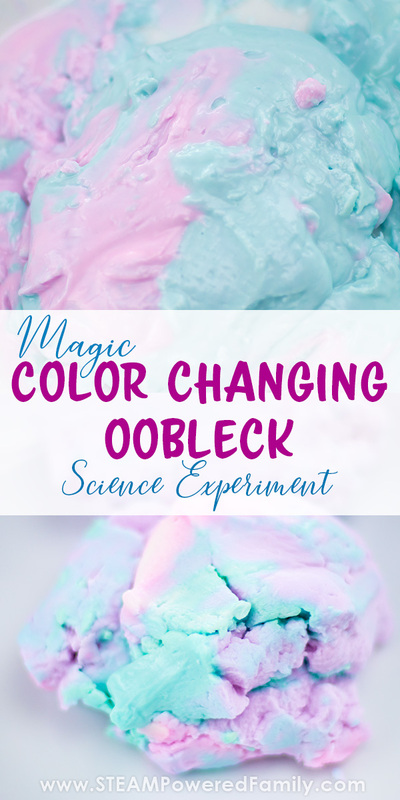 So what happens now when you mix your newly pink oobleck with the blue? It all turns blue… Wait what? This had a few little scientists stunned! The first part of the experiment is self explanatory if you have already done our pH indicator experiment. When our pH indicator comes in contact with an acid (vinegar) it turns pink and when it comes in contact with a base (baking soda solution) it turns blue. But why is our mixed oobleck turning all blue? Did you notice the chemical reaction? The one that was releasing little bubbles? Those bubbles were CO2 gas, and that was an acid base (vinegar/baking soda) reaction. The same reaction we get in our Bottle Rockets, Volcano Slime, and Dino Eggs. During the chemical reaction the acid was neutralized by the base. When neutral our pH solution oobleck is a pale purple. So when all mixed together our Oobleck turns blue as the mixture becomes more and more basic. Remember with STEAM it is all about fostering curiosity and fueling enthusiasm for learning. One lesson that captures the imagination can turn into many lessons. This science experiment and our baking powder vs baking soda science experiment all came out of our first science experiment using homemade pH solution. It’s been an amazing journey and I can’t wait to see where our investigations will take us next. Where will your curiosity and scientific investigations take you? Now go play some more with your Oobleck, because, frankly, it’s the coolest goop around. Pro Tip! Never put oobleck down the drain! Always dispose of it in the garbage. Otherwise you will make a mess of your pipes. Which will make your plumber happy when he hands you the bill, but no one else will be happy. 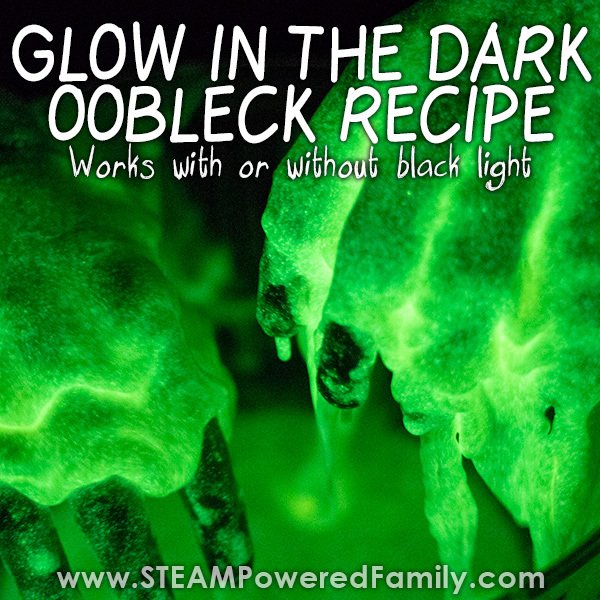 Need more Oobleck recipe ideas? 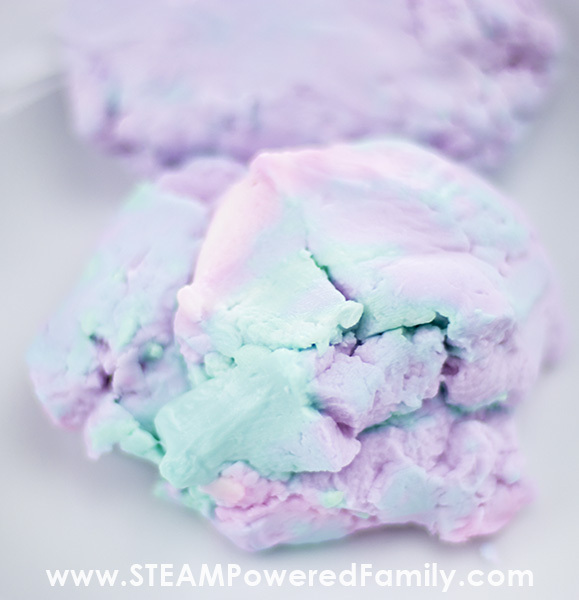 Check out our original Oobleck recipe and play ideas. Do you have this info in a PDF/printable version? Sorry, not yet! But it’s on the list to do.